GPU Caps Viewer: the HardwareInfos's Successor! HardwareInfos is a freeware, it cannot be sold or rented. You can copy it and distribute it freely. In case of distribution (CDROM, ...), you should simply inform The oZone3D Team (info [AT] ozone3d [DOT] net). For any bug report or feedback, please send an email to info [AT] ozone3d [DOT] net and add "[HARDWAREINFOS FEEDBACK]" to the subject. 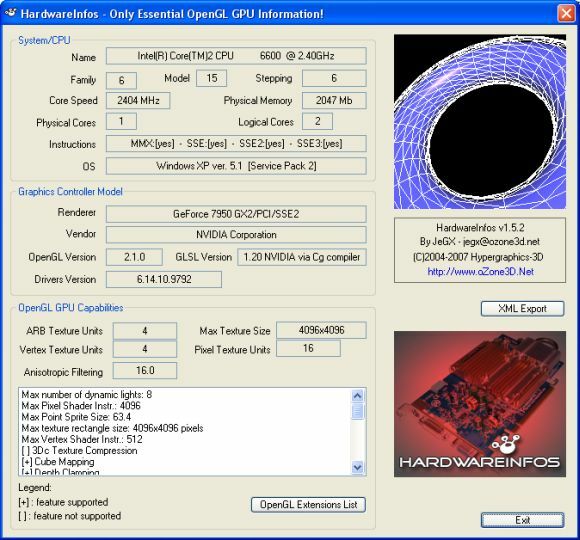 HardwareInfos is a tiny tool that quickly provides essential information regarding the graphics controller and its capabilities under OpenGL. The CPU/GPU information can be exported to a conveniant XML file. 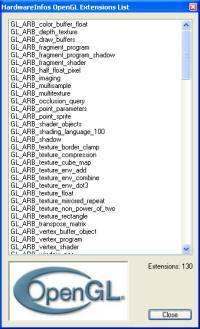 It is also possible to display the OpenGL extensions list supported by the graphics card. System: CPU, frequency, memory, Windows version and Service Pack number. 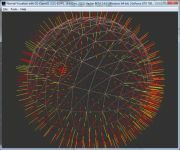 Graphics Controller: model, vendor, supported OpenGL version and graphics drivers version. OpenGL Features: this section is regularly updated with each new release of the 3D engine, but we can still get the same important information such as the texture size, the number of texture units (a fundamental feature with the increased use of vertex and pixel shaders that stress the texture units in order to achieve the latest dazzling graphics effect), vertex and pixel shaders support, VBO/PBO support (Vertex/Pixel Buffer Object: OpenGL extension that helps improving 3D objects rendering). "GDI Generic" simply means that the OpenGL drivers are not installed; by default, Windows does not provide the OpenGL drivers. It is up to the user to perform the update. Just download the graphics drivers corresponding to the graphics controller model closest to the manufacturer. Page generated in 0.0031728744506836 seconds.